Empex has created a new line of interactive watertoys under the trademark AquaneticsTM , where the kids can turn a hand-wheel and produce different sprays, water flows and kinetic effects such as turning pelton wheels, spinners, gears and pinwheels to create a zany effect of water motion. AquawizzTM , AquanoodleTM , AquaswirlTM , and AquamillTM are four new structures in the Aquanetic line. Incorporating several Aquanetic structures in a new expanded curvilinear Aquadek, Empex's latest concept, the AquacircusTM is a climb-and-slide structure that provides myriad experiences and creative interactive activity. SkateMaster is a specially formulated 100 percent acrylic coating designed to withstand the rigors of competitive inline skating. SkateMaster is applied to asphalt or concrete pavement, providing a surface that is ideal for inline hockey or casual skating. SkateMaster colors are available using the ColorPlus system. Line Paints are available for game lines. New Custom Curved Benches can match your circle or curved landscape area. Available in several leg styles, seat thicknesses and seat widths, Doty & Sons' site furnishings can be customized with different stone types and colors, colored concrete and different finishes, including exposed aggregate and sandblast. Factory-direct discounts are available. Cherrington introduced the optional powered roller for its seedbed preparation Rock & Root Screeners. The counter rotating roller tills, grades and prepares the soil for immediate screening to remove rocks, stones and roots. Load and screen the topsoil of all objects larger than the selected screen hole size. No need for second passes—the entire surface is screened clean for a perfect seedbed the first time. Remove existing turf for reseeding or sodding. Old sod can be loaded for removal while at the same time preparing a seedbed for new sod. Cherrington rock picker models come in widths of 4, 5 and 6 ˝ feet, and soil screening of 1 to 6 inches deep. Paddock Pool Equipment Company recently introduced the EvacuatorTM , a one-of-a-kind system proven to reduce hazardous levels of chloramines in indoor pools, which numerous studies have linked to asthma risk in swimmers. In addition, the EvacuatorTM simplifies daily operations for indoor pool owners and provides value by immediately improving HVAC performance and extending the life of metal building elements. Mer-Made announced its capabilities in the field of large diameter fiberglass pipe spools. Pipe 12 inches diameter or higher is most competitively fabricated using fiberglass. Fiberglass fabrication techniques allow much tighter dimensions—reducing space requirements for complicated pipe arrangements. Final color can be matched to filter room piping colors required by local codes. CyclePort by CycleSafe is a modular bicycle shelter that has a contemporary design to blend with traditional and modern environments, providing organized and secure storage of bikes on any site. Basic unit features a sheet-molded composite canopy with a sandstone finish contoured for runoff. The support frame is heavy gauge steel tubing protected with polyester powdercoat taupe finish to blend with the built environment. Side panels can be specified with plexiglass, wire mesh or perforated metal for additional protection from the elements with options for graphics or signage panels. Action Floor Systems has added NitroPanel, a quick-assembly, panel-based portable floor to its line of premium hard maple athletic floor systems. 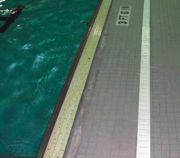 The NitroPanel Portable Floor System is a high-quality, durable sports surface that delivers excellent performance characteristics and features a beautiful surface deck of MFMA grade-marked Action LL (long length) northern hard maple. Expansion Ridge Technology (ERT) accommodates expansion incrementally, board to board, offering strength and uniformity. The NitroPanel subfloor system features stringers of premium laminated veneer lumber (LVL)—stronger and straighter, and without twists or bows common to SPF (softwood lumber).